Rocket fuel is iconic, and it’s dirty. It’s responsible for some of the most stunning images in human history, but the way we make fuel is also what’s holding rocket technology back. This contradiction lies at the core of Phase Four, a company currently developing its sole product: the RF thruster, a rocket thruster powered by plasma instead of traditional gases. It’s already got customers, including NASA, which is testing a Phase Four prototype and hopes to send it to space. “Rocket fuels tend to be very toxic—hydrazine is one of the worst offenders,” says Simon Halpern, Phase Four’s founder and CEO. Liquid hydrazine, a popular fuel for rockets of all varieties, can be quickly absorbed through the skin and acts as a neurotoxin. A severe burn is fatal. “You have to wear practically a spacesuit in order to fuel the satellite,” he says. While hydrazine costs $85 to $100 per pound, the real costs come with the security needed to transport such a toxic substance: protective equipment, detectors, and waste disposal all add up. Phase Four is here to try to do things differently. Halpern is a 15-year space industry vet. He helped to found Aether Industries, which developed high-bandwidth radio transceivers and high-altitude balloons for colour aerial images. The company was purchased by Apple in 2015. After leaving Aether, Halpern “realized that the biggest issue in space transportation is the thruster and the ability to scale them,” he tells PopMech. Hydrazine, with its many protocols and procedures, simply doesn’t fit into a future where rocket launches around the world become commonplace. The alternatives aren’t much better. Plasma isn’t like a cigarette at all. First discovered in 1879 by British scientist Sir William Crookes, the fourth state of matter was originally deemed “radiant matter” due to its illustrious glow. In 1927, American chemist William Langmuir called it “plasma” because its look and movement reminded him of blood plasma flowing through the human body. The name stuck. Plasma is made up of made of free electrons and positively charged ions and, like a gas, has no defined shape or volume. Unlike gasses, plasma reacts to electromagnetic fields and conducts electricity. In the decades since Langmuir coined the term, the stuff has flourished in TVs, neon signs, fluorescent light, watches and yes, rockets. These designs generally generate streams of ions to generate thrust. Specifically, he’s interested in a design known as a Hall Effect Thruster (HET). HETs are well-known within space circles but have what Halpern refers to as “pain points”—complexity which can lead to failure. The RF, he says, is different. Using magnetic fields, it shapes and directs the plasma according to its will. 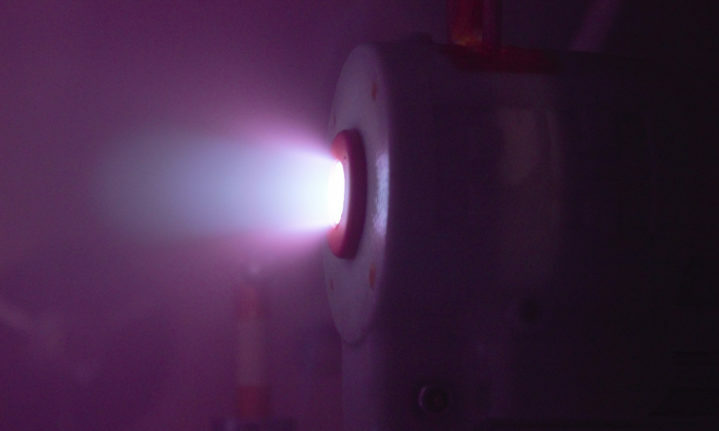 No metal parts are exposed to the plasma itself during this process, which is crucial since that’s where so many other plasma thrusters tend to fail. And since there aren’t electrodes to deal with, that opens up the RF thruster to be propelled by “next generation propellants such as iodine and water,” Halpern says. In terms of performance, testing in April showed that the RF thruster is on par with a HET. Phase Four’s current version of the thruster is small. It’s meant to launch small satellites known as CubeSats, which can fit in the palm of your hand and are typically used for scientific research. But Halpern argues the RF thruster’s design is scalable, that it could be built for something much larger than a CubeSat at the company’s facility in El Segundo, California. He imagines Earth’s orbit becoming crowded very soon. The explosion in private sector activity—SpaceX, Blue Origin, Virgin Galactic—show no signs of slowing down. While space tourism and launching astronauts capture the headlines, Halpern sees a rapidly building infrastructure with no borders or precedent. Government support has been crucial for Phase Four throughout its brief history. In 2015, the company won a million-dollar contract from DARPA, the Defense Department’s developmental wing. Now NASA has purchased a second-generation prototype and is testing it. “Space is a collective commons,” he says, “and any agency, private or for profit, needs to be a good steward of space. You do not want the tragedy of the commons to happen in space.” Halpern says plasma thrusters allow for swift and efficient manoeuvrability in orbit to avoid traffic problems and collisions, a huge and growing worry. But first, a Phase Four thruster has to make it into space. NASA wants to incorporate the RF thruster into something called Integrated Propulsion Assembly, a sort of Swiss army knife of rocketry: it would offer propellant storage and management, engine control electronics, power processing, and a thruster in one integrated solution. The IPA plans to be in NASA’s hands sometime in 2019. While the company isn’t discussing its current sales, it’s clearly impressing some of the right people.